Wes Christensen, a Design COMM architectural model builder and member of the CARGOModern design/build team, left a comment under the "Uh Oh...Natural Wood Modern Dollhouse on Ebay" post that says he can build a version of that dollhouse for an affordable price. Above are samples of Mr. Christensen's work in several forms. Wes also says "I was looking into building a modern doll house for my daughter. Maybe we could work out a deal for some input of anyone's (scale, dolls, materials, etc.) for a good price on a house." Wes has mini house design 2 HERE that you can review and provide feedback on. Does he have a price range to types of materials list so that we can help him? Based on seeing some of his work, my one reaction would be to add more lightness to the dollhouse design. More windows, less heaviness in the walls. Should be light and airy, with simple framing of walls. I like the darker hues of wood that he's employed in his "real" designs, and think the texture is nice. btw, the Design COMM link appears to be broken. Thanks for providing this forum for feedback -- look forward to seeing what he does! What material would he build the ebay lookalike version out of? Not cardboard, right? I like his shipping containers on the cargo site. Perhaps he could make some shipping container looking dollhouses with a deck. That would be fantastic with a sticker price of $200 - $300. Is he talking about kits or a prebuilt structure? Thanks for all the input thus far. I am excited about this and think it could go in a great direction. As far as materials go, I would be using wood (birch ply), acrylic (frosted and clear), maybe some steel elements, painted hard board, and possibly some concrete-like materials (pour-stone)? I think doing some shipping container designs would be awesome, and would fit perfect into this category. I foresee the sticker prices ranging from $200-$500 built. That would be base included but with no furniture. Furniture might come later. Scale? What are the typical scales you would like to see? I see there is a “play scale” for Barbie dolls and a 1:12 scale or 1” scale. It sounds like the 1:12 scale is the most popular and widely used. I would prefer building at that scale so these things are crazy big. What about hinges? Good or not good? The modern style lends itself to open plans and expansive glass that work great for dollhouses because they can be accessed easily. The traditional dollhouse is more like a stage set, having a façade for the front and the back like a cut-away set. I like the 360 degree play of the modern style dollhouse. I was thinking hinges for the roofs. Like an Eichler house hinging up the roof for play? Thoughts? Keep your comments coming and I will get to work on design ideas. I love the house in the upper left photo...It's just what I could live in. Windows are great! I would buy one in either kit or finished...I suppose a kit would be less expensive and better as I live in California and shipping costs for a finished house are always too high these days. 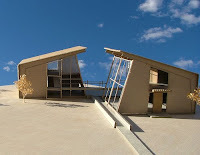 Hopefully, Wes will make a kit like these two houses at an affordable price, given shipping costs. Sign me up! I am also trying to design a modern dollhouse that looks "real". 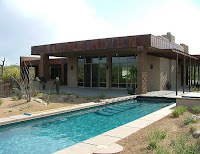 The problem is when you leave out walls or windows to gain access to the rooms for decorating, the style gets lost. 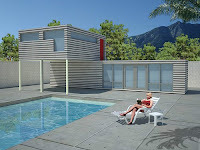 With an Eichler style house that is square and the rooms face the central courtyard I may try using a removable roof. Would that be ok to you dollhouse collectors? The materials sound excellent--especially incorporating some steel elements because you don't see that often if EVER. You are right that 1:12 is king for most modern collectors--allows for more decorating possibilities, etc. I think the $200-$500 price range for a built structure sounds reasonable to most collectors... fanatics. Hinges are fine. I think several UK style houses utilize hinges for accessibility through the side or roof. You know, you could put bat wings and a clown nose on a miniature Eichler house and we would all still want it--so a hinged roof on an Eichler sounds like icing and very interesting, but only if there is still accessibility via the sides. I've never been a fan of looking down to arrange furniture or to view/appreciate miniature settings. For me, It's all about floor-to-ceiling glazing, artistic staircases, fireplaces, balconies, decks, the unexpected like a sunken living room, alcove or other unique architectural touch that makes the structure a place you wished you lived in and a piece of art. But not so "art" that the structure does not make sense--so no teleporting room to room or floor to floor or having to walk through the master bedroom to get to the second bedroom, etc., etc. Hmmmm. I wish I knew how to build a dollhouse - I had one made, but it would have cost a fortune to have it manufactured. I'm done with that dream I'm afraid! My big thing - was what the hell doll goes in a contempo house! Sindy - actually has a workable body, I dislike the cutsie face. The only dollhouse doll I've ever loved is called Caco. But the bodies are cloth wrapped and kids today aren't going to like that. I'm thinking - tiny fashion doll. I know I'm getting ahead of myself here - Wes - email me if you wish and I'll send you images of what I have in mind. Cool Changes of clothes would be so popular. If the right dolls were on the shelves ANYWHERE - they would sell - right everybody? The only decent modern doll I've found for dolls houses is the Takara Compact. Check out these images of this mini house design. inspired by the house posted on ebay, with some added elements. let me know your thoughts. WoW--that was fast! It looks great---especially the added carport. I like the flickr house alot, but would like enough room for bathroom and second bedroom...can your enlarge it a bit to include these additions? ALSO: I mentioned before how I love, love the two houses in the upper left hand picture on Mini Moderns original post of your work. Are you thinking of making kits for one of those??? Please say yes, as these houses have just the right windows and angles to make a really interesting abode. I would buy one immediatly. Thanks for your reply. Very nice! I like the texture of the fireplace and carport wall, and I am wondering if the main house walls might look better in a darker hue. Also, might there be fexibility with interior walls, i.e., removable pieces to create different spaces within? Thanks for the feedback. I agree that it needs a bit more space like the addition of a bathroom. I will re-work that in. Also, the design for the angled house as mentioned is already in progress. I too, love this design. I designed it for a residence. Doing a 1:12 scale house will be great. Stay tuned. Yeah, Doris was right--that second design looks fabulous in 1:12. All the flexible spaces really give you options for decorating. It's um...wow...excuse me, I need to wipe the drool. Thanks for the great responses to the Minihouse2. I have been thinking about how to build and sell this and perhaps to help the buyers out a bit I could sell them as separate units. The main house unit (1) and the garage unit (2), with the bridge that could be added to join the two together. I am going to start construction on this soon and will keep everyone posted on the progress. I am thinking of starting a blog about these designs as well, so I hope you all will follow it too. (it will give Modern MC a break from posting my comments, thanks!) 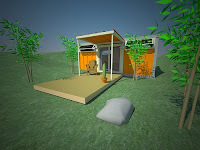 I have also started designing a Minihouse design with the inspiration from shipping container houses from Cargo Modern. Those should be fun as well. Please let us all know your progress on the 2 houses and bridge, as I ready to order. Am looking forward to a blog site as well...what fun!